The Old Fashioned 4th of July and Fireworks show in Etowah, Tennessee is an annual event. It's one of those small town occasions that you don't want to miss. Entertainment in front of the historic L&N Depot lasts all day. Patriotic flags were everywhere. People call out to each other and new friends are made. When you think of small town events, the Old Fashioned 4th of July and Fireworks show is exactly the type of event that comes to mind. There are crafts, food and ice cream vendors, kids games, road race, pancake breakfast and pageant. 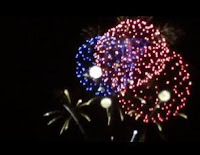 After the day long series of events, the Old Fashioned 4th of July held the largest fireworks show in its history. ThyssenKrupp-Waupaca Foundry sponsored the fireworks show. 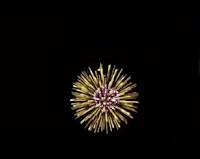 Here are a few photos of the fireworks and a link to the video. 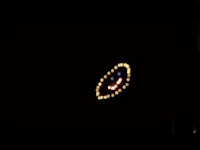 What did you think of the smile face? Isn't it adorable. The big friendly smile over the skies of Etowah is a good representation of what this town is about. Although I'm not from here originally, I proudly claim the town. The Old Fashioned 4th of July is coordinated by the July 4th Committee. This was a fabulous event. Can you imagine how great it's going to be next year? I can't wait to attend!